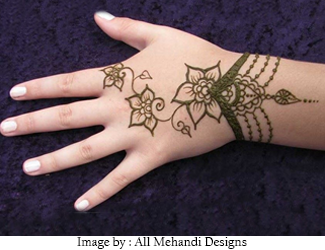 ‘Mehendi’ or ‘Mehndi’ is a paste that is made out of henna leaves. This paste is used to make simple as well as intricate artwork on the hands of prominently a wedding couple or for just about any Indian function. Mehandi is an inseparable part of any Indian ritual right from wedding to auspicious occasions. This paste is applied by all elders and small alike, however, the patience level differs between both. Hence, elders are able to get mehndi designs that are simple yet beautiful whereas the kids are unable to do so owing to the enthusiasm that doesn’t allow them to get the right results. But, we have a solution for this! Every kid is high on adrenaline and may not be able to sit through the whole process of applying Mehandi on their palms. 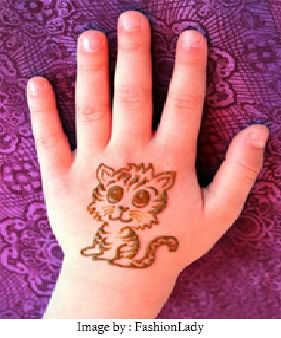 So to shorten the entire process, we have brought to you some simple mehndi designs for kids that will allow them to get their mehandi done on their little hands! Every little girl grows to wish that her hair, makeup and in fact just about everything should be done like her mommy. Here, we make sure those hands of hers get a mehndi design that is easy and simple and will make her look just as pretty as her mother’s! 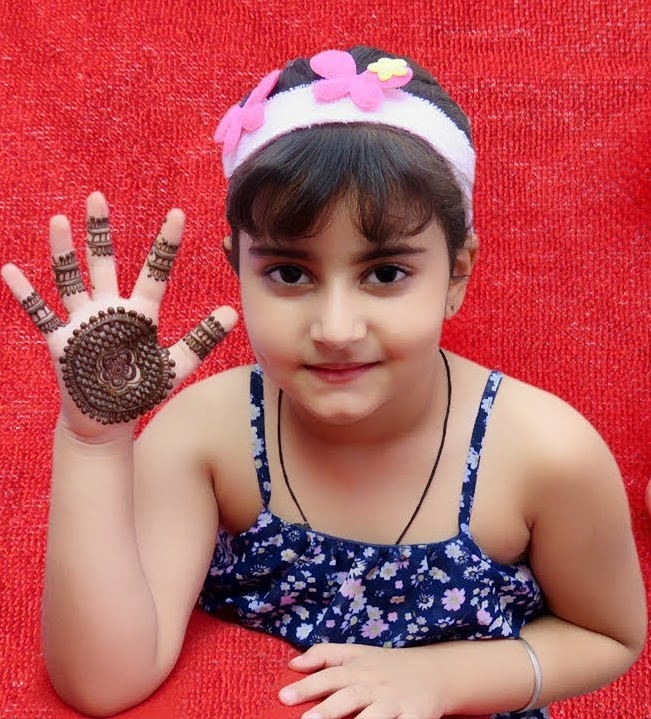 This is one of the easiest and the simplest designs that you can make on your little one’s hands to satisfy their craving for mehandi. This is a simple yet elegant Mehandi design that is set to be the Mehandi design of 2019 because of its advanced look. 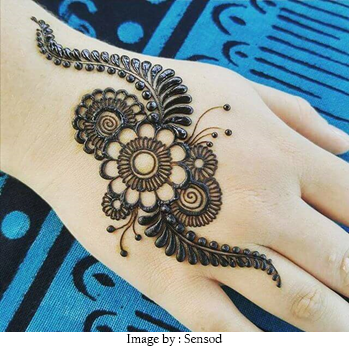 The mehndi too is black unlike the usual making it unique and exquisitely beautiful in nature! Your littlest princess’ hands may not be big enough to do the house chores yet but she can definitely wear this simple yet intricately drawn mehandi design on her hand. This design is with a small crown in the front giving her the feel of a princess. 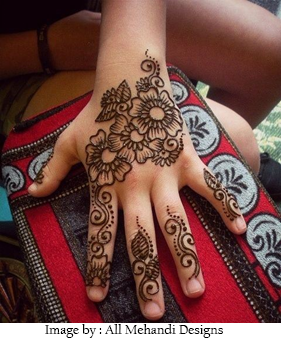 It is also light and is in an Arabic form unlike the heavy Indian mehndi designs are customarily worn by Indian women. Small girls bloom into young women in a concise time just like flowers. These flowers in the design depict the same. The small motifs in the form of a chain leading into a design until the tip of the fingers form into a beautiful design for the hands. With each finger depicting a different yet simple design look delicate and beautiful at the same time. For girls who love minimalistic jewellery, this one is a very good option. This could be a very good alternative to jewellery since it is designed in the form of a bracelet leading up to a finger. If you want to make it neater you can also directly apply the same design on all other fingers as well or just pull it up to the middle finger to make it look more stylish. Small kids are attracted by their pets or their favourite cartoon characters. Many mehndi designers these days create designs for kids that are basis their favourite cartoon character since most kids do not have the necessary patience in them to wait till the mehandi dries away. Creating a cartoon character on their palms is a creative and efficient way to let the Mehandi last for a longer time on their palms. This way they get their Mehandi and one that is inspired by their favourite character! The future of mehndi design is highly inspired by glitter because it is in the nature of little girls to be attracted to anything that glitters! 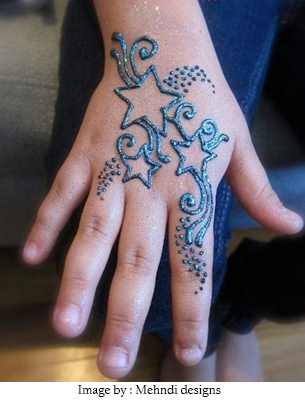 This design is a classy way to display how the Mehandi designs for 2019 will look like with the blue glitter Mehandi and the simple and comfortable design on the palm of a little girl. This mehendi design if applied in the right way appears to be quite stylish and beautiful. This mehandi design is a standalone one and will not require the female to wear any jewellery on top of this since the design shines in itself! 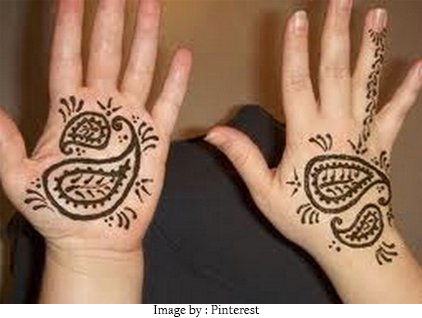 Make sure that when the mehendi wali creates this design you ask her to create exactly as it is shown in the image. 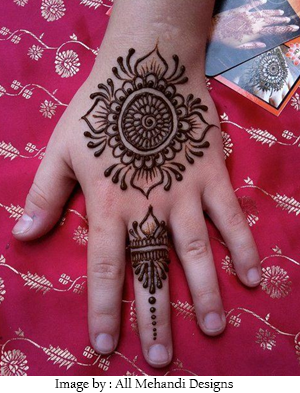 In some instances there are customs where even the smallest kids are made to wear mehndi as part of rituals. In such a case it may become a wild mess applying mehndi to a kid that prefers lolling all over the floor than sitting straight in a corner. 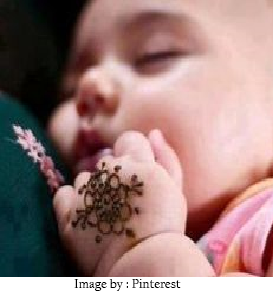 This small design on the back of the palm as shown in the image is enough to fulfil the customs and will not come in the way of a baby playtime. It can be applied while the baby takes a quiet nap and can be removed quickly as and when the child wakes up. This image is an excellent example of a simple and quick-to-make mehendi design that looks similar and beautiful on both sides of the hand. For those who love mehendi, yet would prefer to keep it light instead of a dense design, this one is their go-to mehndi design. It is simple, neat and very quick and easy to make on both sides of the palm.